Me too, Derrick … It’s so expressive and joyful. I remember hamming it up for the camera that day. It was one of those little disposables that come in a sealed clear plastic box so you can take it in the water. My sister, my best friend Gretchen and I spent all day at the club shooting silly photographs, just giddy with anticipation at seeing them developed, especially the underwater shots. Digital photography has made surprisingly gifted photographers out of all of us amateurs, but I miss the anticipation of seeing film developed weeks later. Thanks Ashley. I’ll probably always prefer film, which I only abandoned when I began the blog, for which the immediacy of digital was essential. ^^ I totally get that. Have you ever seen Jim Brandenburg’s North Woods Journal, from the November 1997 National Geographic?? Jim spends a period of time in relative isolation in Maine’s North Woods, and he only allows himself to take one photo per day (on film!). It is absolutely astounding work — and proof that such photographers were gods compared to us mere mortals raised in ease of digital imaging. I haven’t seen the book, Ashley. Thanks for the recommendation. My sister Elizabeth has a the largest selection of photography books. I’ll try her first. What a photo. Perfectly timed. I find your journey most interesting. Thank you, Joseph. It’s been a winding road, but I am constantly just plain floored by all the good people I’ve met on the way. What a journey. You make me realize we all are so self aware of our bodies that it starts to work against us. If only we could embrace the idea of being unique individuals and go from there instead of letting our culture rule our thoughts on personal beauty. It took me a long time (& a lot of photographs) to realize how completely I see myself through the eyes of other people … It’s a woman’s cultural curse, in so many ways. But these days, slowly, I’m learning that I am fully capable of seeing my own beauty, on my own terms. I can’t begin to tell you what a joyful thing that is. The smile and the eyes have not changed. Though I think nobody defies gravity better than seventh graders. Now look, you made me laugh! I love how this photo captured your spirit. ^^ I couldn’t think of a better way of putting that. Absolute truth. Thank you! I needed that. Love the post. And yes, we are all in this together. I must admit, I commented on your other post because I stumbled across it in the reader and I didn’t know much about your background. Since you were nice enough to send me some nice replies, though, I was interested to find out more about you. Having read some of your other posts, I now have a better understanding of your body image project. I wish you luck with it. Your photograph is great, by the way. I wish I had one of myself in which I managed to look so quite so poised. How on earth did you manage to smile and fall at the same time? That’s quite a skill. I only hope there was water underneath you or at least a trampoline. I love this picture too. 🙂 I’m falling into a swimming pool, & having a great time doing it! It was my little sister, actually. 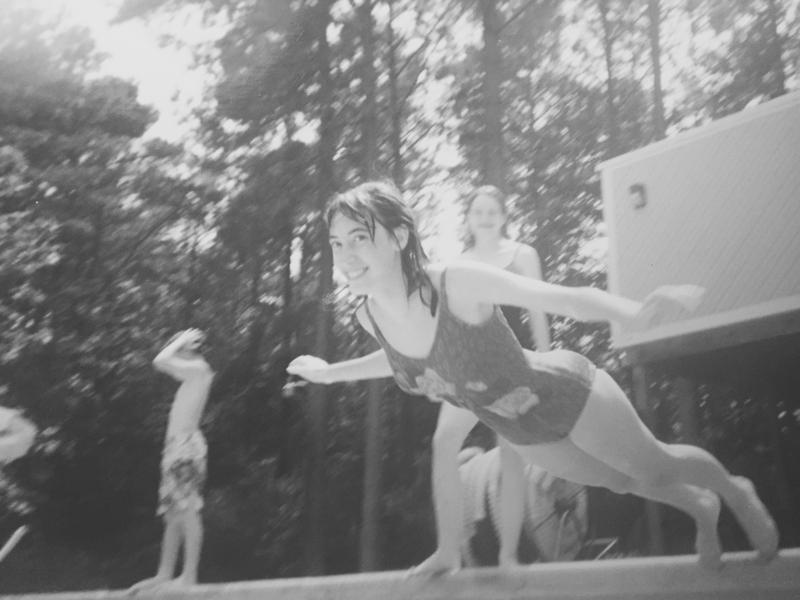 We had a disposable waterproof camera and spent all day at the pool just being silly and taking pictures. Mesmerizing photo. I love looking at old pictures whether mine or others. Old pictures almost always convey a sense of serenity, peace and happiness, and I can never tell if its indeed true due to the relative simplicity of old times, or if its an escape mechanism of the present. Maybe a little of both? 🙂 I feel just like you do, and I think that feeling is beautiful. Thank you for that, Lulu. Sometimes it’s still hard, but it’s SO GOOD. 🙂 I can’t wait to get to know you a little better. Glad you’re here! Hey Alfa “Zulu”. Just browsing around. Don’t know enough about you and your life to really qualify for an opinion. That smile is there, inside. 🙂 And I still see the same in your current photos. We don’t change really. I’m still the little 8-10 year olds boy I was a long time ago. None the wiser, but still. Whenever in doubt with your current self, take that photo out. And look at yourself in the eye. A long way for better. Period. Again I don’t know your story. There must have been very hard times, but the mere fact that we are talking about it now is a good sign. One thing I’ve learned in blogging is that one does find friends. And E-shouldrers to E-lean on. Though I sense you are doing much better than you probably did a few years back.